Shrouded in a thick blanket of fog, Bwindi Impenetrable Forest certainly looked every bit as menacing as its name suggested on the morning I was scheduled to ascend its emerald canopy. Before embarking, we are briefed by a Uganda Wildlife Authority (UWA) ranger who rhymes off a litany of obstacles we may face during our trek. For starters, there are ravenous African Dorylus Ants known for their vicious bite, stinging nettles, forest buffalo, high altitudes and precipitous slopes to overcome. Most dangerous of all however, and the reason for the 2 armed rangers that must accompany us, are the easily agitated forest elephants who have a proclivity for hostility towards humans, retribution for centuries of mistreatment. Armed with insect repellent, knee gaiters, gardening gloves and an unfounded belief in my own invincibility, I am undeterred. To ensure the mountain gorillas are not overwhelmed, gorilla trekking is limited to 8 people per gorilla family, resulting in an intimate encounter for those fortunate enough to partake in the trek. We set off through the forest single file. I cannot help but notice how still the forest is. I had anticipated our arrival in the forest being announced loudly by a thunderous chorus of calls, emanating from the forest’s invisible inhabitants. Instead, we are met by a rather unsettling hush interrupted only by the occasional call of a cricket. Bwindi Impenetrable Forest is an imposing stretch of land spanning ~330km2 , situated in the southwestern limits of Uganda’s territory. At a maximum height of 2706m, it is home to approximately half of the world’s remaining mountain gorilla population. Mountain gorillas’ habitat is increasingly limited, spanning a small stretch of land bordering the Democratic Republic of Congo (Virunga National Park), Rwanda (Parc National des Volcans) and Uganda (Bwindi Impenetrable Forest and Mgahinga Gorilla National Park). The mountain gorilla population continues to oscillate in the Congo due to poaching, civil war, the bushmeat trade and the ubiquitous quest for untapped oil deposits. Rwanda and Uganda paint a more optimistic picture as numbers in both countries have either stabilised or increased in recent years, due, in no small part, to the revenue generated from tourists eager to connect intimately with one of nature’s most magnificent species. Still, with only ~880 mountain gorillas remaining in the world (2011 census), it will take an internationally concerted effort to avoid catastrophe for the great ape. As we press onwards through the forest, the veil of mist permeating Bwindi slowly lifts, exposing the secrets hidden within the forests’ boundaries. There are black and white colobus monkeys performing gravity defying stunts in the tree limbs above us whilst L’Hoest’s monkeys emerge and vanish like ethereal ghosts. Bwindi’s 350 species of birds begin to chatter noisily as biting army ants devour worms the size of skipping ropes. 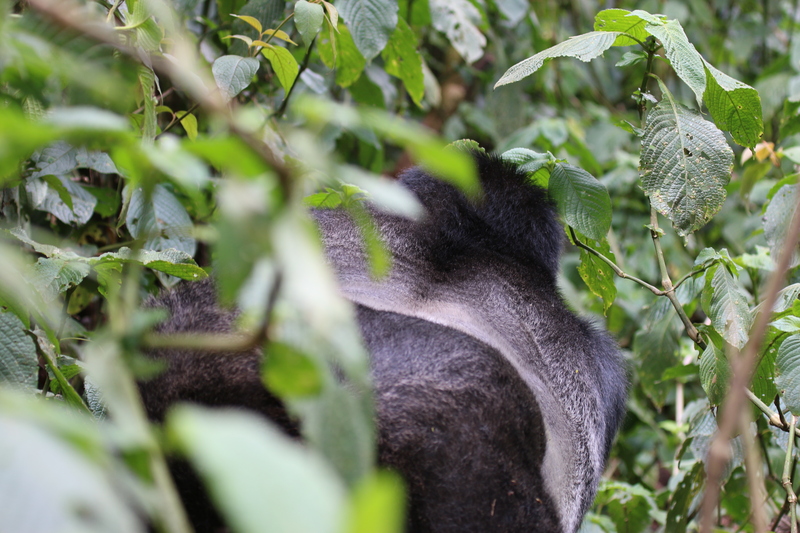 After trekking for nearly two hours through Bwindi’s corridors, our UWA ranger suddenly begins to descend through a steep thicket. Sensing that we are nearing our goal, we follow silently. Sliding down the mountains’ slopes and grabbing on to branches for support, I gain a real sense of appreciation for the mountain gorillas’ agility. We are met in a dense patch of shrubbery by two pygmy rangers who had set off early in the morning to track the gorillas. The UWA ranger attempts to explain the parameters governing our imminent mountain gorilla encounter, but I am too distracted by the animated bushes rustling over my left shoulder, the sound of branches snapping directly behind me and the overwhelming musky smell emanating from the gorillas behind me. After manoeuvring behind a bush, I am met by the soft, tender eyes of an adult female mountain gorilla belonging to the Nshongi group. I seem to be more amazed by her presence than she is of mine. She continues to snap off branches around her to feed her muscular frame while I continue to snap photographs. 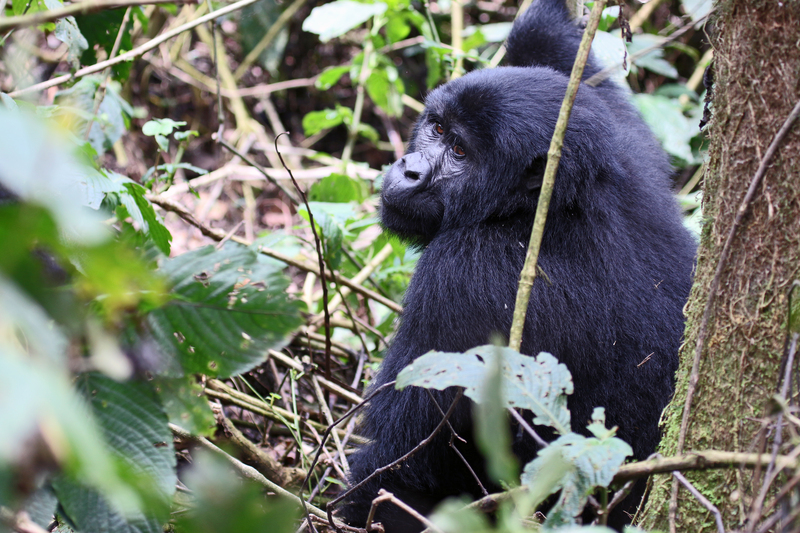 Female mountain gorilla takes a short break from feeding to flash her unforgettable eyes at us. In case I needed a reminder of how interwoven our evolutionary branches are, a juvenile male gorilla begins hiccupping uncontrollably from a nearby bush. Still getting used to humans, he attempts to climb a tree that is no match for his weight to shelter from our peering eyes. He balances for a surprisingly long time before crashing to the ground. 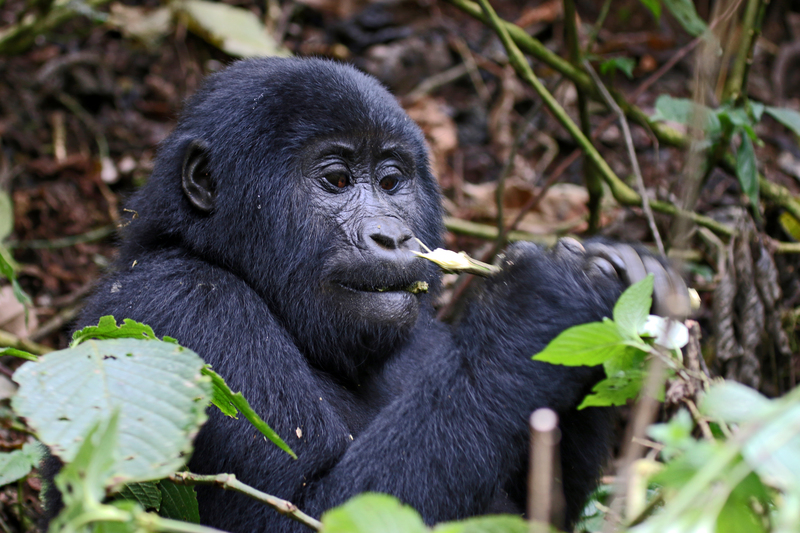 Juvenile male gorilla feeds on shrubbery in Bwindi Impenetrable Forest. We follow the gorillas as they move from bush to bush until we are met by a gorilla with a distinctly crowned head and a silver streak down his back. At 1.8 metres and 200kgs, the silverback of the Nshongi family is menacingly large. His imposing frame is contrasted by sage eyes that hint at a gentler side within. Fiercely protective of his family, the silverback can eat up to 30kgs of food per day in order to maintain his dominance over rival adult males who aspire to supplant him one day. Like lions, male gorillas commit infanticide after defeating the incumbent patriarch in an epic, often deadly, battle. The act of infanticide will bring his newly acquired harem into estrus, so that he may begin to sow his roots. Despite their fierce reputation, silverbacks have an endearing side that is most apparent when they are interacting with their own offspring. In the Nshongi silverback’s presence, the UWA rangers make coarse grunting noises to convey our peaceful intentions. I emit a groan of my own when told that an hour has nearly passed. Our time with the gorillas is limited to an hour to reduce the risk of pathogens spreading between us, a particularly vital concern given the ~98% of DNA that is common to our respective species. The Nshongi silverback raises his hand to break off a branch revealing a fist that eclipses my entire head. He devours the nutrient portion of the branch before discarding it, and, shortly afterward rises to his haunches, revealing his bulging muscles. After a brief pause he disappears into the forest, his family in tow. I put my lens cap back on and retreat into the forest feeling that my moment with mountain gorillas was far too short, but very much hopeful that the same will not one day be said about our respective species. Nshongi silverback shows off his muscular frame. I was certainly not anticipating having the illusion that we are the planet’s only creatures capable of walking upright shattered when I entered Kibale National Park. There I was, however, standing aghast as I watched a chimpanzee disembark from a tree, look me straight in the eye, and proceed to walk, erectly, deeper into the forest. Many travellers passing through East Africa choose to visit Uganda in the hopes of encountering mountain gorillas in their natural habitat. Too few, however, stay to experience the effervescent chimpanzees. The chimpanzee habituation experience in Kibale National Park offers a glimpse into the daily life of chimpanzees. From dusk till dawn, we are on chimpanzee time: following chimpanzees as they forage, feeding when they stop to feed and resting when they stop to rest. 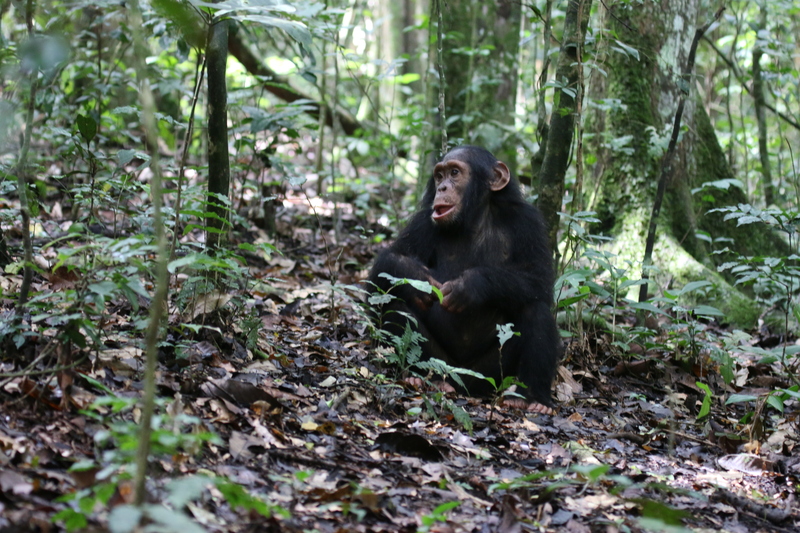 Early in the morning we seek out the chimpanzees, chasing their echoing calls throughout the forest. They are not difficult to find. 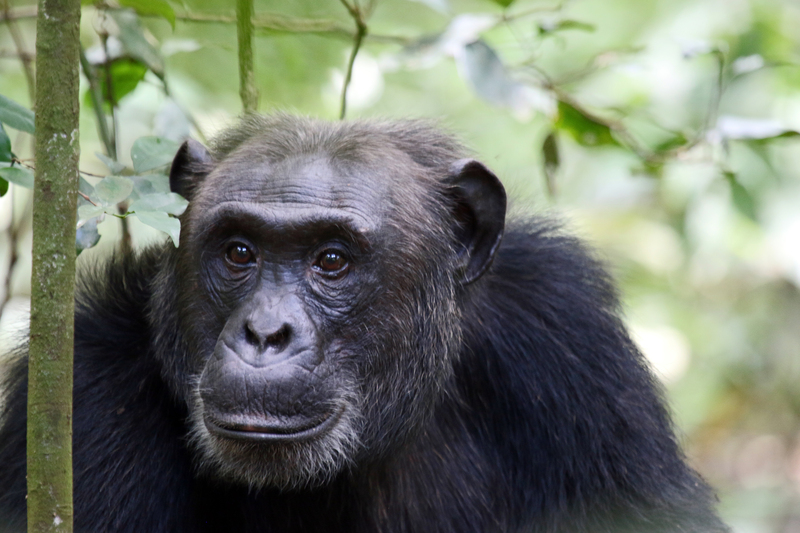 In contrast to the chilled out mountain gorillas, chimpanzees are bubbling with personality. A chimpanzee calls out and a chorus of chimpanzees respond in kind. A fervent dash through the forest ensues as scattered groups of chimpanzees coalesce. The alpha male and his allies strut purposefully through a maze of trees like a gang of thugs looking for trouble. As they come across other chimpanzees from their community, a series of ear-splitting shrieks and shouts pierce the sky as intimate family dynamics play out before your eyes. Mothers quarrel with other females over the unsolicited admonishment of their offspring, attempts by females to appease the alpha male are met with violent outbursts and young chimpanzees playfully mock each other. The shrieking reaches a crescendo as the chimpanzees frenetically scale a series of towering trees. The bedlam quietly dissolves into a tranquil feeding session. Alpha male enjoys a fleeting moment of tranquility. Young chimpanzee takes advantage of a brief rest before the chimpanzees are on the move again. Just when you’ve caught your breath and begin to marvel at the delicate way chimpanzees interact with one another, a tree rustles, an ape slides down it and a lone chimpanzee’s call unsettles the stillness of the moment. The surrounding trees spring to life as chimpanzees slide down the trees like firemen responding to a fire, leaving the manna above to follow the alpha male. A mischievous adult male chimpanzee hollers something in our direction before charging, screaming as he hurls himself towards us. Following protocol, we look away and hold our ground. He pauses momentarily at the base of a tree just in front of us, pounding the base of it with his open palm. The tree responds rhythmically, creating an effect that sounds distinctly like a war drum. The remaining chimpanzees erupt in unison as the offending chimpanzee runs past us. The war drum continues to reverberate in my chest, driven by my pulsating heartbeat. We do our best to follow the chimpanzees, but they are incredibly nimble and we repeatedly lose sight of them. When it seems as if we have lost them for good, we catch a glimpse of a man-like creature gliding through the foliage ahead. Without warning, the chimpanzees stop to rest. A cluster of chimpanzees sit single file and begin to meticulously groom one another. A young male takes advantage of the opportunity to bond with the alpha male while others feed in nearby trees. A chimpanzee looks skyward as he is fastidiously groomed. Like Harvey Dent, the iconic two-faced comic book villain, chimpanzee’s sometimes tolerant, peaceful nature devolves into an evanescent burst of violent, aggressive behaviour without warning. It is difficult to watch chimpanzees tenderly care for their young, groom each other peacefully or lie together happily, without seeing the best of human nature in them. In contrast, it is difficult to watch chimpanzees quarrel violently, using force to get what they want, and not see the worst of human nature in them. All the while, it is difficult to spend a day in the presence of wild chimpanzees and not appreciate all that nature has to offer in them. Almost human. 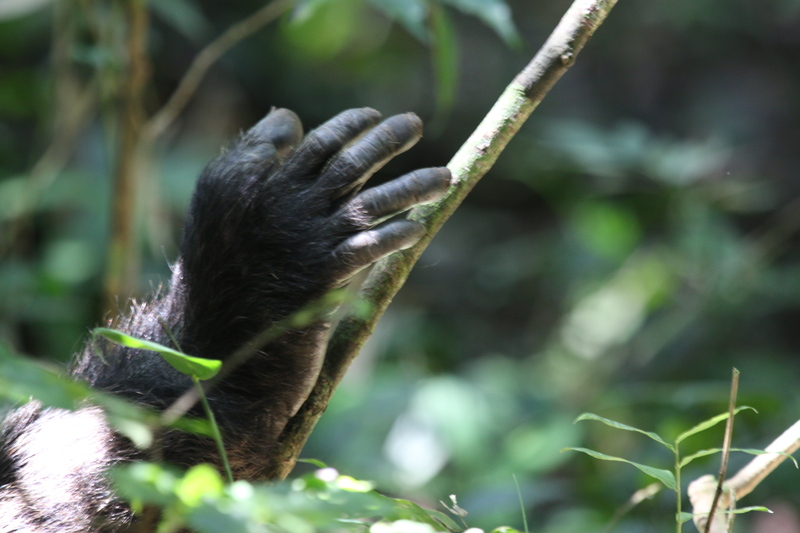 A chimpanzees outstretched hand offers a glimpse into the past. Stay: Hotel Sojovalo in Kampala for its quiet location, humble staff and regally spacious rooms. Gorilla Valley Lodge in Bwindi for the mouth watering food, breathtaking vista of Bwindi Impenetrable Forest and the short early morning drive to Rushaga Gate, the starting point of the gorilla trek. Kasenyi Safari Camp in Queen Elizabeth National Park for its majestic setting in truly wild Africa, stunning luxury tents, the haunting sound of a lion roaring in the distance while you lie in bed, the fantastic chef and the impeccable staff. Try: Wild game meat, or anything else (no really, anything) at the Lawns Restaurant in Kampala. Don’t: Leave Uganda without doing the chimpanzee habituation after your mountain gorilla trek!